The plastic magazine holder has is a floor stand made from clear acrylic, offering a stylish display that fits in at any location, including exhibition halls, real estate agencies, doctor offices, shopping centres, travel agencies, and even retail stores. 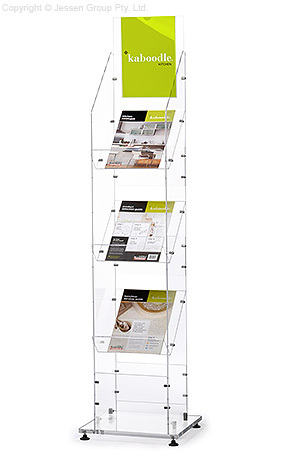 The acrylic literature racks are designed to hold catalogues, brochures, leaflets, and flyers that are A4 (210 x 297mm) standard sized within each of the pockets. These pockets are made from 3mm thick clear acrylic, whilst the sides and base of the stand are made from 5mm thick acrylic to offer increased durability. The plastic magazine holder also has an area for you to put a sign header to place brand names or even advertising! This signage holder is able to hold up to a 210 x 297mm sign within it. The brochure stands utilise an angled pocket to best present the literature for patrons to peruse through. Assembly of the kit is simple by using the included tools, meaning we can despatch the unit flat to help keep shipping costs down. These floor brochure stands make a great addition to any business, with the tiered design allowing you to place heaps of leaflets for passersby to take without taking up much room! The huge online catalogue is home to hundreds of products in a variety of categories, all at low prices & made of high-quality materials to be placed around your location. With over 20 years in the business, Slimline Warehouse has made it easy to order products for your business & receive them fast. Purchases made by 1pm EST will despatch same day to anywhere in Australia with most in stock products, including Sydney, Canberra, Perth, Melbourne, Adelaide, Brisbane, Gold Coast, & Bendigo!